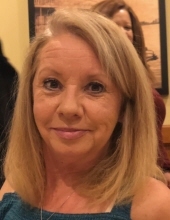 MANNING – Teresa Logan Brailsford, 53, died Monday, December 24, 2018, at her home. Born January 26, 1965, in Manning, she was a daughter of Clarence Logan and Betty Jean DuBose Logan. She is survived by her parents of Manning; companion, Pat Hurst of Manning; three sons, Ricky Pack of Manning, Shaun Pack (Jessica) of Greeleyville and Jeffrey Pack (Heather) of Summerville; two daughters, Ashley Morris (Max) and Kelli Pack, both of Manning; two sisters, Dana Sprott (Jim) and Angel Drose (Donnie), both of Manning; eleven grandchildren; and special friend, Scarlett Layne (Aaron) of Manning. She was preceded in death by a brother, Shaun Logan. A Celebration of Life service will be held 5 - 7 p.m. Monday, December 31, 2018, at the Matrix Center, 4648 Kingstree Highway, Manning. To send flowers or a remembrance gift to the family of Teresa Logan Brailsford, please visit our Tribute Store. "Email Address" would like to share the life celebration of Teresa Logan Brailsford. Click on the "link" to go to share a favorite memory or leave a condolence message for the family.